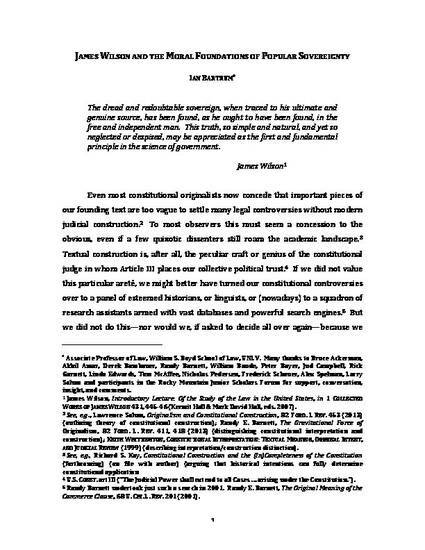 This paper explores the moral philosophy underlying the constitutional doctrine of popular sovereignty. In particular, it focuses on the Scottish sentimentalism that informed James Wilson’s understanding of that doctrine. Wilson, a transplanted Scotsman, was perhaps the nation’s preeminent lawyer in the middle 1780s. He was one of the most important delegates to the Constitutional Convention, one of the nation’s first law professors, and served as Associate Justice on the first Supreme Court. In these capacities, he developed the most sophisticated and coherent account of popular sovereignty among the founding generation. My initial effort is to enrich our understanding of Wilson’s account by revealing its roots in moral sentimentalism. With these roots established, I am able to offer a historically contextualized normative account of popular sovereignty. I identify two justifications: (1) “free and independent” citizens provide the most reliable epistemological connection to natural law; and (2) the purpose of government is to provide citizens the necessary freedom to make autonomous moral judgments. With these justifications in place, I am able to offer two suggestions on how the structure of popular sovereignty can guide our modern constitutional constructions: (1) The federal government—not the states—should remain the primary and presumptive guardian of individual rights; and (2) we should identify sovereignty, not privacy, as the common theme underlying both textual and unenumerated rights. To that end, the judicial inquiry should focus on whether we can justify a particular intrusion into moral agency in terms of some greater benefit to moral autonomy writ large.